This article is about the reality TV show. For the group that emerged from it, see American Juniors (group). For that group's album, see American Juniors (album). American Juniors is an American reality television singing competition series that was broadcast for one season, in 2003, on the Fox Network. The series was a spin-off of American Idol, but with younger contestants, and had the same production team as American Idol: it was created by Simon Fuller and 19 Entertainment, along with FremantleMedia, and directed by Bruce Gowers, and produced by Nigel Lythgoe and Ken Warwick. However, unlike American Idol, the goal of the competition was not to find a single winner, but rather to create a singing group of five of the contestants. In this way, American Juniors more closely resembled the British series S Club Search, which had produced the group S Club Juniors. The show spawned the singing group American Juniors, which disbanded in 2005 after lackluster sales. The show was taped in Hollywood, California. Two thousand children and teenagers auditioned for the show. From there, a selected group of kids and their parents were flown out to Hollywood to participate in "Hollywood Week." During "Hollywood Week", several cuts took place, eliminating all but 20 of the children and teens who originally auditioned. These kids were shown on TV during 2 top-20 episodes, which each showcased 10 kids. For each top-20 episode, America voted for the 5 kids they wanted to see in the top-10. Once the top-10 was formed, America voted each week for the one contestant they wanted to put into the group. The results were aired the following evening with the next round beginning the following week. Taylor Thompson was the first contestant voted into the group. She was eventually followed by her younger sister, Tori Thompson, Chauncey Matthews, Lucy Hale, and Danielle White. Group performance: "Kids in America"
Group performance: "Put a Little Love in Your Heart"
Group performance: "Make Your Own Kind Of Music"
Group performance: "United We Stand"
Taylor Thompson's music video: "Cheeseburgers For Me"
Group performance: "Do You Love Me"
Group performance: "Still Rock And Roll To Me"
Morgan Burke - "Bring The House Down"
Danielle White - "Never Had A Dream Come True"
Jordan McCoy - "You Are The One"
Katelyn Tarver - "Have You Ever"
Morgan Burke performs: "Build Me Up Buttercup"
Katelyn Tarver performs: "I'll Never Fall In Love Again"
Chantel Kohl performs: "Open Arms"
Jordan McCoy performs: "I Love You More Than Yesterday"
Danielle White performs: "Colors Of The Wind"
AJ Melendez performs: "I'll Be There"
Danielle White's Encore performance: "Never Had A Dream Come True"
Chantel Kohl's Encore performance: "Sundown"
AJ Melendez's Encore performance: "Alive"
Official American Juniors group perform: "One Step Closer"
American Juniors became one of the highest-rated television shows of the summer season, with approximately 11.9 million viewers on June 3, though the numbers dropped 40% toward the end of July. Nonetheless, the producers were satisfied of the strong teen demographic. A second season was planned for fall 2003, later postponed to the summer after American Idol (season 3), then called off. 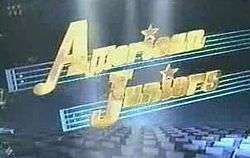 The show led to the creation of the five-member group American Juniors. The group made a brief appearance on the December 2003 American Idol Christmas special, An American Idol Christmas. Their debut album American Juniors was released on October 26, 2004, after a year's delay from its original scheduled date. The group American Juniors disbanded in 2005, after having received relatively little publicity. Lucy Hale is currently by far the most successful contestant from American Juniors, having acted in a number of films and television series, most notably the series Pretty Little Liars, which premiered in June 2010. She returned to her musical roots after a number of years in 2014 with the release of the country album Road Between for Disney Music Group's "Nashville" label. In 2011, Tori and Taylor Thompson resurfaced on NBC's The Voice as a singing duet. They were selected and coached by Cee Lo Green but were voted off in the first live show. Katelyn Tarver released a short-length album as well as her debut album Wonderful Crazy and her debut EP A Little More Free. She also got her big break in acting as Jo Taylor in Big Time Rush. Jordan McCoy was signed to Diddy's label, Bad Boy Records, having only released demos. She is currently part of the revival of the late girl group, Dream (also formed by Diddy), now called Lady Phoenix.